Let me guess, another of those missing Tyneside motorways? Absolutely, yes. However, this one manages both to be relatively dull, and oddly interesting at the same time. Let me explain further, and it will hopefully become more clear. It's relatively dull as it is quite a simple extension of the Central Motorway East to the northwest, relieving the busy poor quality Claremont Road. It travelled pretty much in a straight line. It's also mentioned only in passing in the relevant documentation. So that's the dull bit. What's the interesting bit? Oh, right! What is it then? It's the A167 from the Central Motorway East up to the Stamfordham Road roundabout. One more mildly interesting fact about the motorway - it was occasionally known as the North West Radial Motorway. Exciting, eh? Not really, no. Can you show the route to me? 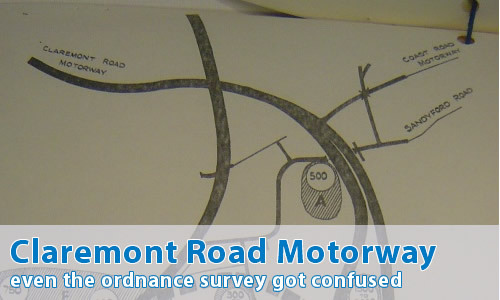 I've been reading your section on Tyne & Wear with a mix of fascination and dread, but can give you a little bit of info on this road - in the 2005 Tyne & Wear A-Z, the A167 is shown as "Jedburgh Road" but with the extra name (in brackets) "North West Radial"; it seems that, 20 years later, it's got the name is was supposed to! In response to Mark Randall, the 1978 edition of the Newcastle upon Tyne A-Z calls the then A6127 the North-West Radial; so the name has been in continuous use since opening.